Festivals and Online discounts go hand in hand today. However it is important that you make your money work for you. Come October and it is time for the festival season to kick in. It also happens to be the time when ecommerce portals try to outdo each other with special sales and discounts. So how do you make the most of it? Read on to find out. To start with make a wish list of things you want and really need to buy in the festive season. Critically examine this so you can include things that are absolutely necessary. Look up online and pre select the products and add them to your online wish list so that you do not need to waste time during the actual sale period. Smruti Alinje Bhalerao, Founder, Prittle Prattle PR Agency says it is important to exercise caution over unrealistic discounts and big savings that are advertised. “When we actually go through it the price of the product is double or much more than we see. Sometimes we even exchange our old products at a very throwaway price. We should not fall into the traps of unreal urgency the show like limited stock or last day of the offer. We must always check and buy genuine products.” This is the time when al ecommerce majors are in overdrive mode and marketing pitches are at their peak. Vikash Parichewal, Founder, Raisin, a contemporary fusion brand for women says, “but sometimes, these benefits come with hidden marketing agendas that can go unnoticed if one does not pay close attention. One of such tricks you need to be wary of is ‘Get it or it’s gone.’ Your email will be flooded with ‘Limited Stock’, ‘Discount ends tonight!’ and it is easy to fall for these emergency call outs. Be smart and know that sales are a frequent thing and you can catch the products you want at reduced prices in further sales as well.” Another thing to be wary of is freebies. Do note that what is free may or may not (more likely) be what you do not need. Reading the fine print is another important aspect. When you see terms like “conditions apply”, make it a point to read and understand them first before you loosen your purse strings. Fine print includes aspects like product descriptions, description of payment options and explanation of return policies. “The price of the product listed and the price during checkout may vary as some websites tend to add taxes and other delivery charges in the cart, thus discount provided is actually not as much as it is shown. Be cautious while making the purchase and check the final price in the cart before making the payment,” advices Dipti Singla, Co-founder, Bnext.com, a B2B Wholesale Distribution Software. Remember the devil is in the details and it is imperative to check the product specifications carefully before placing the order. In case of apparel check the size chart, it may vary across the brands, for electronics check the technical specifications the images of different models may look the same. Also keep an eye on delivery dates while placing orders as delivery may take longer than usual given the surge in orders. “The products sold during the sale season are often non-returnable and non-refundable. The little asterisk mark next to the prices or products is worth taking a look at before making the purchase. Often the products offered are at the said discounted prices, only after you fill your cart with an amount they have set for the discount availability. 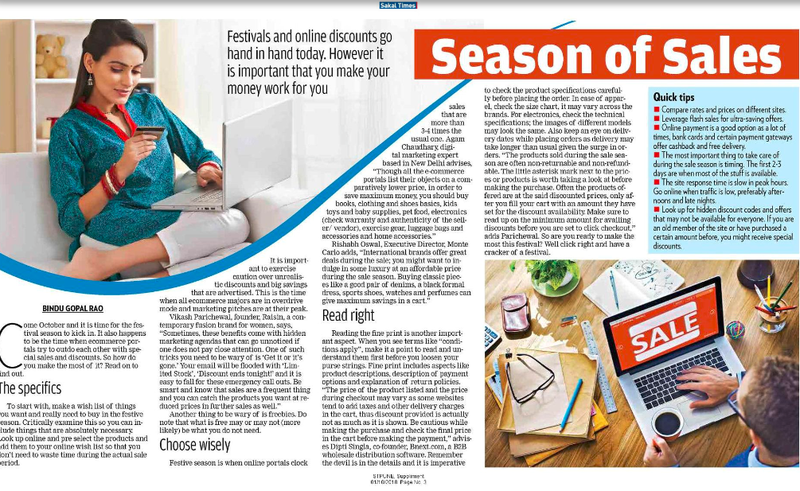 Make sure to read up on the minimum amount for availing discounts before you are set to click checkout,” adds Parichewal. So are you ready to make the most this festival? Well click right and have a cracker of a festival. Compare rates and prices on different sites. Leverage flash sales for ultra-saving offers. Online payment is a good option as a lot of times, bank cards and certain payment gateways offer cashback and free delivery. The most important thing to take care of during the sale season is timing. The first 2-3 days are when most of the stuff is available. The site response time is slow in peak hours. Go online when traffic is low, preferably afternoons and late nights. Look up for hidden discount codes and offers that may not be available for everyone. If you are an old member of the site or have purchased a certain amount before, you might receive special discounts.